In November of 2004, How to Dismantle an Atomic Bomb and the special edition U2 ipod were released. I didn’t fall in love with Atomic Bomb as I had with All That You Can’t Leave Behind, but there are a few songs that I love from it including Original of the Species, Love and Peace or Else and Sometimes You Can’t Make it on Your Own. 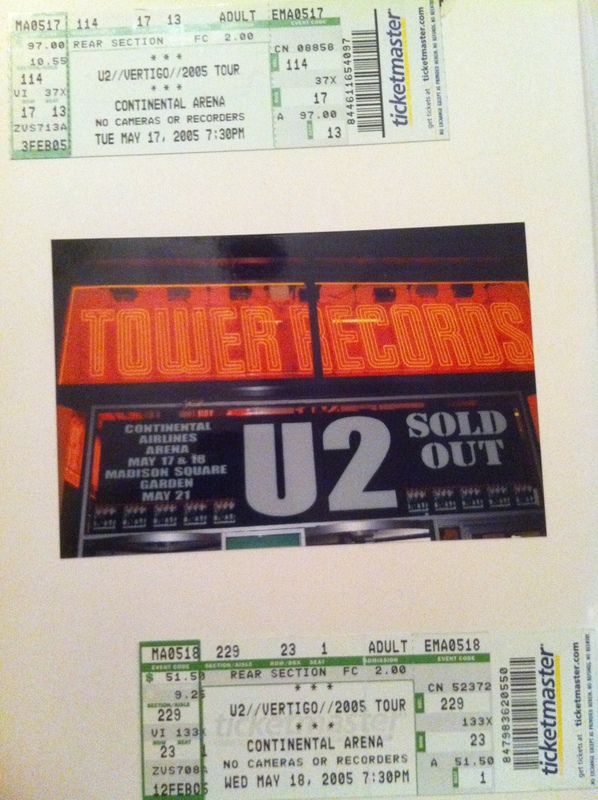 I bought the U2 special edition ipod – my first ipod. 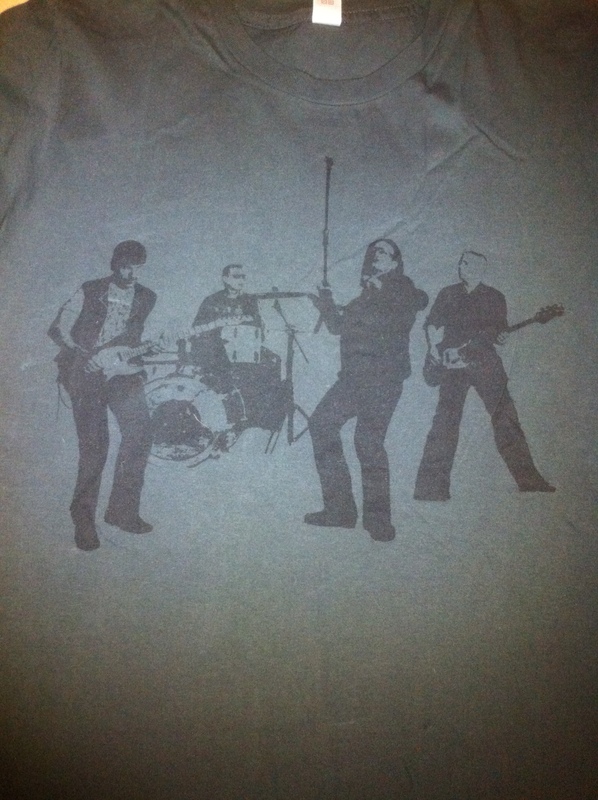 It had 20 gigs and came with 400 U2 songs called The Complete U2 on itunes. 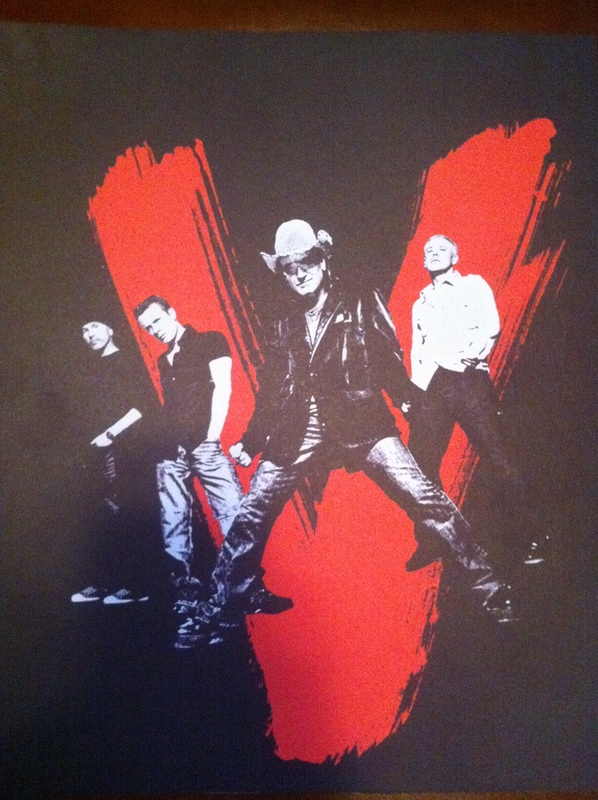 In 2005, U2 toured in support of How to Dismantle an Atomic Bomb with the Vertigo Tour. 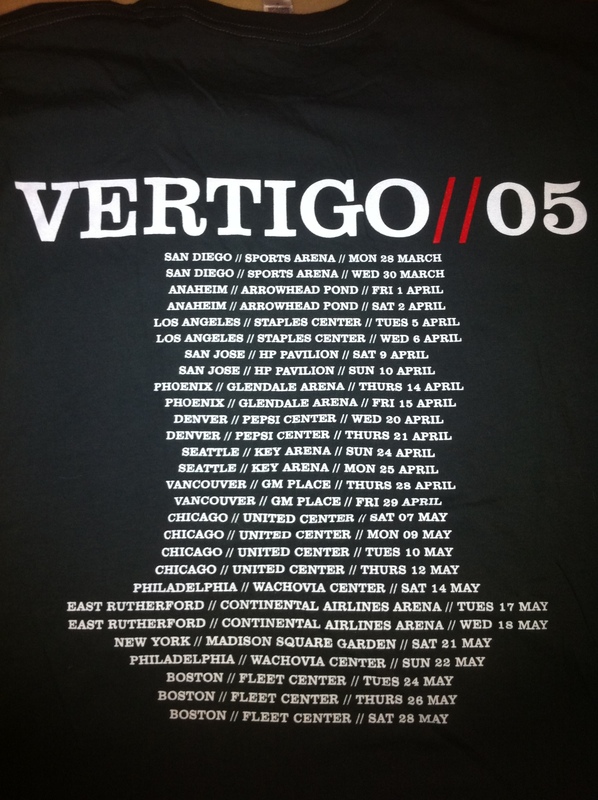 I was as disinterested in the Vertigo tour as I was interested in the Elevation Tour. 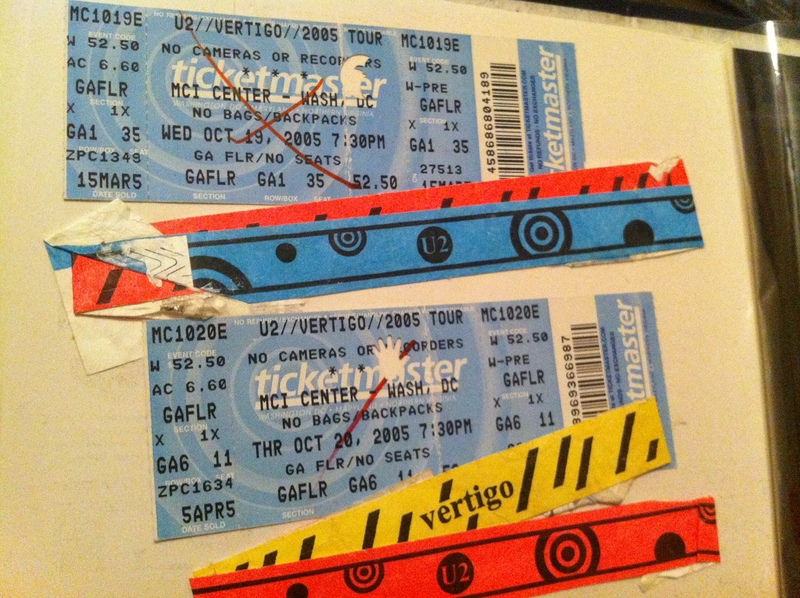 Originally, I had tickets to 15 shows, but I only went to 8 – haha only. And only three of those shows were GA. I thought I hadn’t been so into Vertigo because I wasn’t that into the How to Dismantle An Atomic Bomb album, and I was very into Lisa Marie Presley who was on tour at the same time, and I had just adopted my puppy Elvis and didn’t want to leave him – plus Larry had really bad hair on Vertigo. 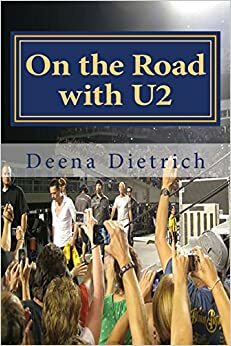 But from reading my journal from those days, I realized that it was also because I had joined a church and gotten very involved, including leading the youth group, bought a house, and gotten a 9-5 job for the first time in my life, so I didn’t feel as free to travel all around to U2 shows. But I did make it to Philadelphia, New Jersey, New York City, Washington DC, and Las Vegas. Luckily I still kept a journal then because I don’t really remember those shows, except for Larry beating that drum in front of me during Love and Peace. The best things happen whey you don’t plan on them. Today Tasha and I were supposed to meet at the Wachovia Center at 7 and planned to sit in our seats behind the stage. But Jenny called around 3 to say she got us GAs. Tasha and I went in around 7:30. Kings of Leon opened. We stood about halfway between the catwalk and soundboard. During the fourth song, Electric Co, this lady from U2 came up to us because Tasha was dancing and gave us wrist bands to get inside the ellipse. We stood one person back in front of Adam. When Larry sang during Love and Peace, I ran to the back of the ellipse. I was jumping up and down as if I was on a pogo. U2 played Running to Stand Still, An Cat Dubh, 40, Zoo Station, Into the Heart – all which they did not play on Elevation. It was a really good show, and I was very excited but I don’t feel the craziness as in past tours. Maybe that’s a good thing. I left Philadelphia the morning after the U2 show and drove to Asbury Park, for the Lisa Marie Presley concert at the Stone Pony on Sunday May 16th – her last of the tour. It was amazing! I stood up front right at the rail at the stage. Priscilla was there, and Lisa shook my hand and said, ‘Thank you’ at the end of the show. After the show, I drove 2 hours to my hotel in East Rutherford – I got lost and was exhausted. Paola and Gina arrived about 1am last night/this morning. I got up at 4am and got a cab into New York City to see Lisa Marie on Good Morning America. They didn’t let us in until after 7am, and Lisa didn’t come on until about 8:45. She only sang one song, Idiot, but it was pretty cool. I was SO close to her and apparently I was on tv because my mom called to say she saw me on tv singing along. Now I’m going back to the hotel to rest for a bit before the U2 show. The U2 concert tonight at Continental Airlines Arena in Jersey was better than the one in Philly Saturday. Kings of Leon opened again, and I do not like them. This show, Jersey1, was the same as Philly except U2 played Original of the Species (my favorite off the new cd) and they played Vertigo twice – closing the show with it. I had a seat for this show – a great seat. I was behind the stage – behind Edge about 7 rows up. It was very close and a very good view. As good as the concert was, I’m just not as into it anymore. I’m considering selling my tickets for the Fall shows and my ticket for the Philly show on Sunday. This U2 show was the best of the week so far. Saturday in Philly was great because it was my first one of the tour, and we were on the floor up front in front of Adam. Yesterday’s concert had amazing energy – both from the band and the audience. And they played Original of the Species. Tonight, Jersey2, was the best set list. U2 played Gloria, The Ocean, Bad and I Still Haven’t Found What I’m Looking For with a band they pulled out of the audience. I went to the show with Jenny. We had seats side stage the last row up top, so we just stood behind our section so we had room to move around. It was a fun time! The morning after the U2 show in Jersey Jenny and I drove into NYC. We went to Lisa Marie’s free concert in City Hall Park. I was front row at the rail center stage. It was a great show! After walking around the City for a bit, I went to Broadway to see All Shook Up, which was great! The next day, Friday May 20th, I went back into NYC to go to the Daytime Emmy Awards. It was so cool! I saw all my favorite stars from As the World Turns. It was a great night! 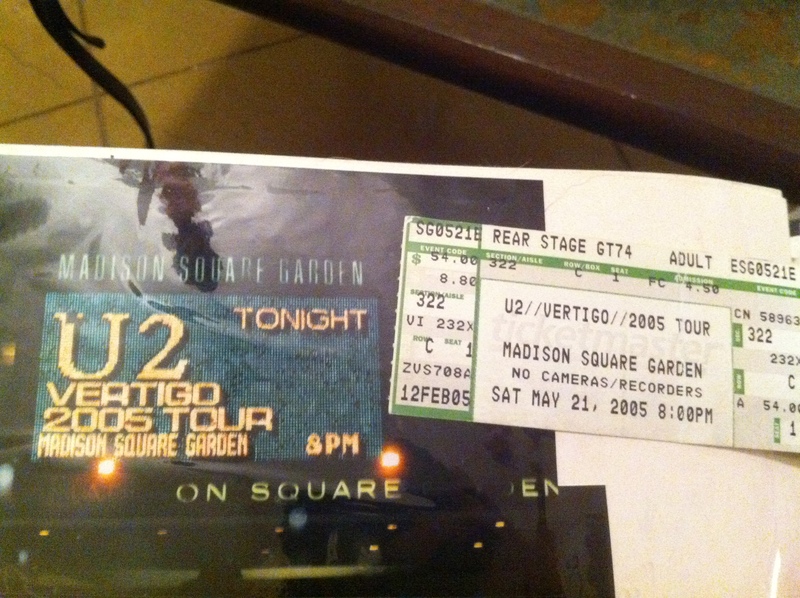 Today was the U2 show at Madison Square Garden. It was actually my least favorite of the four I’ve seen this week. Kings of Leon opened again – ugh! I saw the show with Tasha, and we had good seats behind the stage not too far up. The only thing different U2 played was a David Bowie cover. They played Original of the Species again. At least I got to hear every song they are playing over the 4 shows I went to. It’s sad, but I’m just not as into it anymore. I want to go home. I’m not going to the Philly show tomorrow. My first U2 concert of this leg, and I had a blast, but I am so glad I’m only going to 4 shows this leg. I knew this show, DC1, would be good because it is the 4th anniversary of the Baltimore Elevation show where Larry hugged me. And since they are not playing Baltimore this tour, DC is the next best thing. I went to this show first show in Washington DC at the MCI Center with Jennifer, and Paola was also there. Damian Marley opened. Jennifer and I got into the ellipse. We stood in the back at the catwalk, so when Larry came out during Love and Peace, I was right in front of him. He smiled at me and waved. It was a great show! Traci from work also went. After the show, about 5 of us met up and went to the Double T Diner. I’m wiped and doing it all again tomorrow, but at least I’m not working like I did today. Tonight’s U2 show, DC2, was the best one I’ve seen this tour. 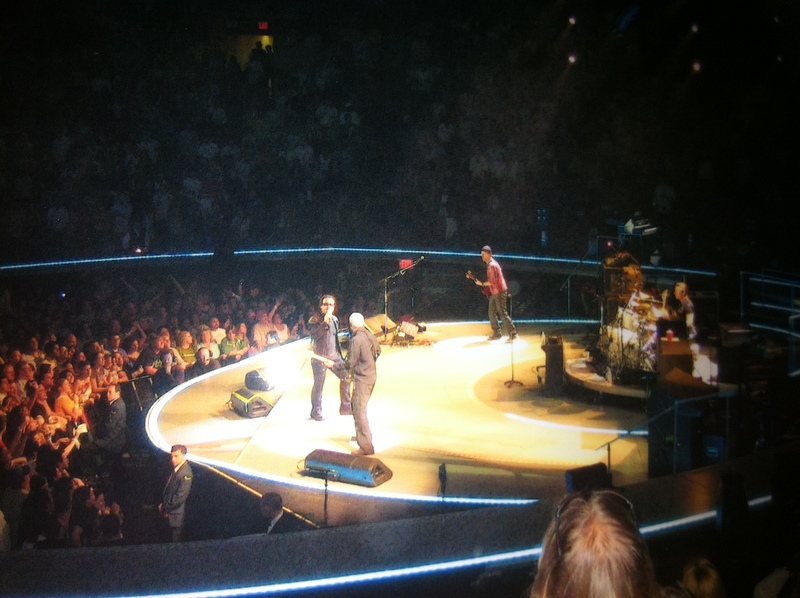 They played four out of my top five U2 songs – Still Haven’t Found, Bad, Pride, and Wild Horses. Plus I saw the show with Jennifer, Paola and Gina. It was great to be able to see it with everyone. We were again inside the ellipse right where Larry played Love and Peace. Tonight I got the subtle Larry nod. I love Vegas! Cindy and I arrived yesterday morning at 11am. We checked into Ballys and then had pizza at New York New York. We walked over to MGM to check out the U2 GA line situation, even though I had a seat for the show. We gambled at Boardwalk Casino, shopped at the Venetian and Alladin and had dinner at Café Lux. I went to the U2 show (Vegas1) at the MGM Grand Arena last night, which was really great. My seat was behind the stage in the second level. Damien Marley opened. There was an Elvis impersonator on the floor, so Bono sang ‘Love and Peace’ like Elvis and then sang ‘Can’t Help Falling in Love’ after ‘One.’ U2 played ‘Wild Horses’! It was a really good show. I was up for over 22 hours yesterday and then only slept for 4 hours. Today we went to the Hard Rock Hotel and Casino, Freemont Street, Treasure Island, Mirage and the Flamingo. I’m really getting into this gambling thing. I love the slots now! We had a fantastic dinner at Paris. 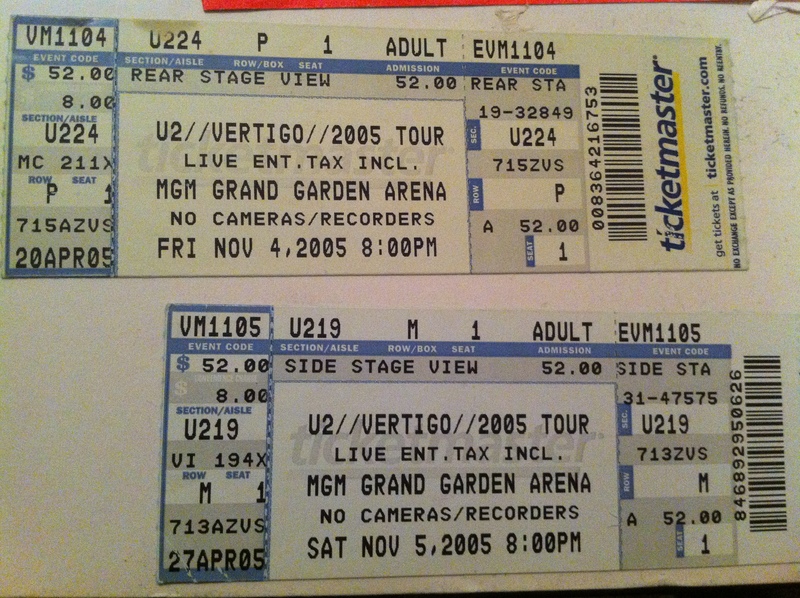 I went to the U2 show (Vegas2) again tonight at the MGM Grand Arena. It was absolutely amazing! Mary J Blige sang ‘One’ with Bono. 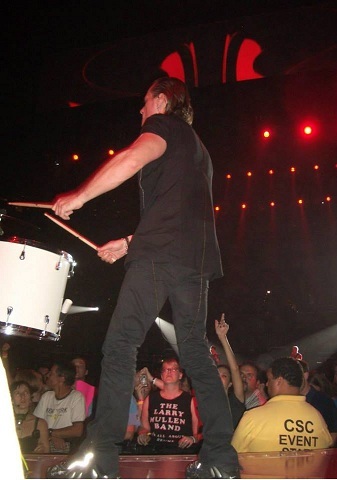 The lead singer from the Killers sang ‘In a Little While’ with Bono. U2 played ‘Zoo Station’, ‘The Fly’, ‘Until the End of the World’ and ‘Mysterious Ways’. After the show, I met up with Cindy at Paris casino to gamble some more. This blog post is part of my A to Z April Challenge about ‘My U2′ – what I love about U2 from A to Z. Thanks for stopping by. 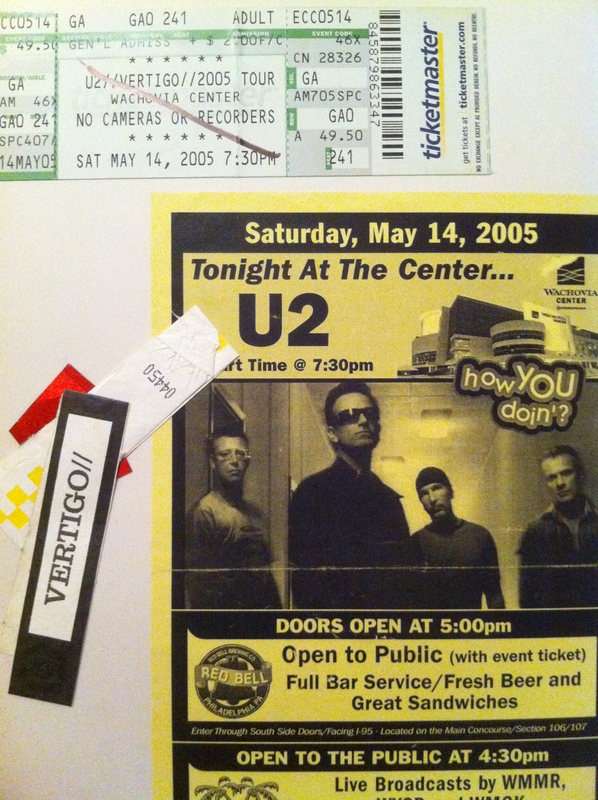 I am also blogging the A to Z Challenge on my other blog Deena’s Days about ‘My Music’ – music I love from A to Z.
sorry off the grid due to illness… i so wanted that ipod… you can never have enough versions of u2 songs… i had gotten a 15 cd set of u2 concerts… it was very cool. happy day and to u2. hope you’re feeling better. i still have that ipod (even though it doesn’t work anymore) thanks for stopping by.